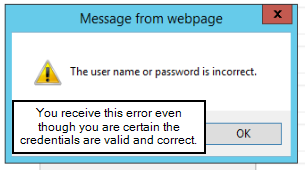 When configuring the data tab, you receive the following error when testing your LDAP connection, regardless of the credentials being valid. This is likely caused by copying realms' web.config files to a new IdP, and not bringing over the certificates the realms are referencing. The certificate selected in the System Info -> License Info section is used to encrypt/decrypt the data sent through LDAP. Therefore, if this tab is referencing a certificate that doesn't exist on the local server, it won't know how to read the password for the LDAP bind. If this server is a test server or a server that employees will not be using, you can select any certificate that is issued by SecureAuth. See image below for reference. If the server is a production appliance, or an appliance that employees will be using, you will want to export the certificate from the appliance which you copied realms from, and import that certificate into the new IdP. Then, you can select the certificate in the System Info -> License Info tab. Make sure when exporting that you export with the private key, and select "make exportable."